South Jakarta Water Resources (SDA) Sub-dept. repairs Krukut River's retaining wall located in Petogogan Urban Village, Kebayoran Baru. Three excavators are deployed to assist retaining wall repair that will be done for 100 meters.
" We target to complete it in two months"
South Jakarta SDA Sub-dept. Head, Holi Susanto mentioned sheet pile will be installed in this repair. 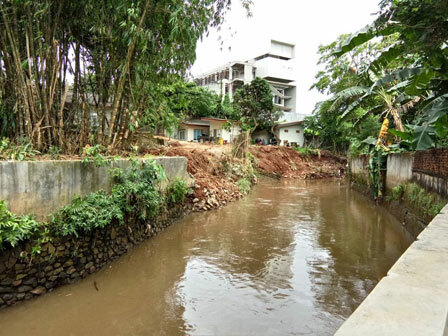 "Soon, we will install sheet pile along 100 meters to strengthen the retaining wall from landslide," he explained, Monday (4/2). Besides sheet pile installation, his side will also dredge the river since retaining wall debris blocks half of Krukut River flow. This debris causes the river becomes narrower and shallower. Dredging is done from Kebayoran Baru Sub-district to Mampang Prapatan. He hopes dredging can increase river's capacity. "We target to complete it in two months. We also deploy four heavy equipment to dredge the river," he said.